"Mahler" redirects here. For the 1974 film, see Mahler (film). For other people with the surname, see Mahler (surname). For the racehorse, see Mahler (horse). Gustav Mahler (German: [ˈmaːlɐ]; 7 July 1860 – 18 May 1911) was an Austro-Bohemian late-Romantic composer, and one of the leading conductors of his generation. As a composer he acted as a bridge between the 19th century Austro-German tradition and the modernism of the early 20th century. While in his lifetime his status as a conductor was established beyond question, his own music gained wide popularity only after periods of relative neglect which included a ban on its performance in much of Europe during the Nazi era. After 1945 his compositions were rediscovered by a new generation of listeners; Mahler then became one of the most frequently performed and recorded of all composers, a position he has sustained into the 21st century. In 2016, a BBC Music Magazine survey of 151 conductors ranked three of his symphonies in the top ten symphonies of all time. 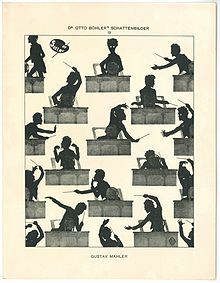 Mahler's œuvre is relatively limited; for much of his life composing was necessarily a part-time activity while he earned his living as a conductor. Aside from early works such as a movement from a piano quartet composed when he was a student in Vienna, Mahler's works are generally designed for large orchestral forces, symphonic choruses and operatic soloists. These works were frequently controversial when first performed, and several were slow to receive critical and popular approval; exceptions included his Second Symphony, Third Symphony, and the triumphant premiere of his Eighth Symphony in 1910. Some of Mahler's immediate musical successors included the composers of the Second Viennese School, notably Arnold Schoenberg, Alban Berg and Anton Webern. Dmitri Shostakovich, Benjamin Britten, Leonard Bernstein and Peter Maxwell Davies are among later 20th-century composers who admired and were influenced by Mahler. The International Gustav Mahler Institute was established in 1955 to honour the composer's life and work. The Mahler family came from eastern Bohemia and were of humble circumstances; the composer's grandmother had been a street pedlar. Bohemia was then part of the Austrian Empire; the Mahler family belonged to a German-speaking minority among Bohemians, and was also Ashkenazic Jewish. From this background the future composer developed early on a permanent sense of exile, "always an intruder, never welcomed." In October 1860, Bernhard Mahler moved with his wife and infant son, Gustav, to the town of Iglau (Jihlava), 25 km (16 mi) to the south-east (Moravia), where he built up a distillery and tavern business. The family grew rapidly, but of the 12 children (three daughters) born to the family in Iglau only six survived infancy. Iglau was then a thriving commercial town of 20,000 people where Gustav was introduced to music through street songs, dance tunes, folk melodies, and the trumpet calls and marches of the local military band. All of these elements would later contribute to his mature musical vocabulary. When he was four years old, Gustav discovered his grandparents' piano and took to it immediately. He developed his performing skills sufficiently to be considered a local Wunderkind and gave his first public performance at the town theatre when he was ten years old. Although Gustav loved making music, his school reports from the Iglau Gymnasium portrayed him as absent-minded and unreliable in academic work. In 1871, in the hope of improving the boy's results, his father sent him to the New Town Gymnasium in Prague, but Gustav was unhappy there and soon returned to Iglau. On 13 April 1875 he suffered a bitter personal loss when his younger brother Ernst (b. 18 March 1862) died after a long illness. Mahler sought to express his feelings in music: with the help of a friend, Josef Steiner, he began work on an opera, Herzog Ernst von Schwaben ("Duke Ernest of Swabia") as a memorial to his lost brother. Neither the music nor the libretto of this work has survived. Mahler was influenced by Richard Wagner during his student days, and later became a leading interpreter of Wagner's operas. Mahler left the Conservatory in 1878 with a diploma but without the silver medal given for outstanding achievement. He then enrolled in the University of Vienna (he had, at his father's insistence, sat and with difficulty passed the "matura," a highly demanding final exam at a Gymnasium, which was a precondition for university studies) and followed courses which reflected his developing interests in literature and philosophy. 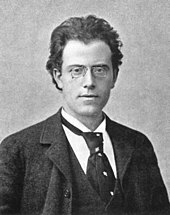 After leaving the University in 1879, Mahler made some money as a piano teacher, continued to compose, and in 1880 finished a dramatic cantata, Das klagende Lied ("The Song of Lamentation"). This, his first substantial composition, shows traces of Wagnerian and Brucknerian influences, yet includes many musical elements which musicologist Deryck Cooke describes as "pure Mahler." Its first performance was delayed until 1901, when it was presented in a revised, shortened form. From June to August 1880, Mahler took his first professional conducting job, in a small wooden theatre in the spa town of Bad Hall, south of Linz. The repertory was exclusively operetta; it was, in Carr's words "a dismal little job," which Mahler accepted only after Julius Epstein told him he would soon work his way up. In 1881, he was engaged for six months (September to April) at the Landestheater in Laibach (now Ljubljana, in Slovenia), where the small but resourceful company was prepared to attempt more ambitious works. Here, Mahler conducted his first full-scale opera, Verdi's Il trovatore, one of 10 operas and a number of operettas that he presented during his time in Laibach. After completing this engagement, Mahler returned to Vienna and worked part-time as chorus-master at the Vienna Carltheater. From the beginning of January 1883, Mahler became conductor at the Royal Municipal Theatre in Olmütz (now Olomouc) in Moravia. He later wrote: "From the moment I crossed the threshold of the Olmütz theatre I felt like one awaiting the wrath of God." Despite poor relations with the orchestra, Mahler brought nine (13 times) operas to the theatre, including the new Bizet's Carmen, and won over the press that had initially been sceptical to him. After a week's trial at the Royal Theatre in the Hessian town of Kassel, Mahler became the theatre's "Musical and Choral Director" from August 1883. The title concealed the reality that Mahler was subordinate to the theatre's Kapellmeister, Wilhelm Treiber, who disliked him (and vice versa) and set out to make his life miserable. Despite the unpleasant atmosphere, Mahler had moments of success at Kassel. He directed a performance of his favourite opera, Weber's Der Freischütz, and 25 other operas. On 23 June 1884, he conducted his own incidental music to Joseph Victor von Scheffel's play Der Trompeter von Säckingen ("The Trumpeter of Säckingen"), the first professional public performance of a Mahler work. [n 1] An ardent, but ultimately unfulfilled, love affair with soprano Johanna Richter led Mahler to write a series of love poems which became the text of his song cycle Lieder eines fahrenden Gesellen ("Songs of a Wayfarer"). In January 1884, the distinguished conductor Hans von Bülow brought the Meiningen Court Orchestra to Kassel and gave two concerts. Hoping to escape from his job in the theatre, Mahler unsuccessfully sought a post as Bülow's permanent assistant. However, in the following year his efforts to find new employment resulted in a six-year contract with the prestigious Leipzig Opera, to begin in August 1886. Unwilling to remain in Kassel for another year, Mahler resigned on 22 June 1885, and applied for, and through good fortune was offered a standby appointment as conductor at the Royal Deutsches Landestheater in Prague by the theatre's newly appointed director, the famous Angelo Neumann. In Prague, the emergence of the Czech National Revival had increased the popularity and importance of the new Czech National Theatre, and had led to a downturn in the Royal Landstheater's fortunes. Mahler's task was to help arrest this decline by offering high-quality productions of German opera. He enjoyed early success presenting works by Mozart and Wagner, composers with whom he would be particularly associated for the rest of his career, but his individualistic and increasingly autocratic conducting style led to friction, and a falling out with his more experienced fellow-conductor, Ludwig Slansky. During his 12 months in Prague he conducted 68 performances of 14 operas (12 titles were new in his repertory), and he also performed Beethoven's Ninth for the first time in his life. By the end of the season, in July 1886, Mahler left Prague to take up his post at the Neues Stadttheater in Leipzig, where rivalry with his senior colleague Arthur Nikisch almost began at once. This conflict was primarily over how the two should share conducting duties for the theatre's new production of Wagner's Ring cycle. Nikisch's illness, from February to April 1887, meant that Mahler took charge of the whole cycle (except Götterdämmerung), and scored a resounding public success. This did not, however, win him popularity with the orchestra, who resented his dictatorial manner and heavy rehearsal schedules. 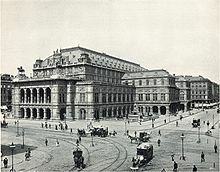 On 17 May 1888, Mahler suddenly resigned his Leipzig position after a dispute with the Stadttheater's chief stage manager, Albert Goldberg. However, Mahler had secretly been invited by Angelo Neumann in Prague (and accepted the offer) to conduct the premiere there of "his" Die drei Pintos, and later also a production of Peter Cornelius's Der Barbier von Bagdad. This short stay (July–September) ended unhappily, with Mahler's dismissal following his outburst during a rehearsal. However, through the efforts of an old Viennese friend, Guido Adler, and cellist David Popper, Mahler's name went forward as a potential director of the Royal Hungarian Opera in Budapest. He was interviewed, made a good impression, and was offered and accepted (with some reluctance) the post from 1 October 1888. In the early years of Mahler's conducting career, composing was a spare time activity. Between his Laibach and Olmütz appointments he worked on settings of verses by Richard Leander and Tirso de Molina, later collected as Volume I of Lieder und Gesänge ("Songs and Airs"). 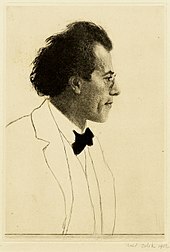 Mahler's first orchestral song cycle, Lieder eines fahrenden Gesellen, composed at Kassel, was based on his own verses, although the first poem, "Wenn mein Schatz Hochzeit macht" ("When my love becomes a bride") closely follows the text of a Wunderhorn poem. The melodies for the second and fourth songs of the cycle were incorporated into the First Symphony, which Mahler finished in 1888, at the height of his relationship with Marion von Weber. The intensity of Mahler's feelings is reflected in the music, which originally was written as a five-movement symphonic poem with a descriptive programme. One of these movements, the "Blumine," later discarded, was based on a passage from his earlier work Der Trompeter von Säckingen. After completing the symphony, Mahler composed a 20-minute symphonic poem, Totenfeier "Funeral Rites", which later became the first movement of his Second Symphony. On arriving in Budapest in October 1888, Mahler encountered a cultural conflict between conservative Hungarian nationalists who favoured a policy of Magyarisation, and progressives who wanted to maintain and develop the country's Austro-German cultural traditions. In the opera house a dominant conservative caucus, led by the music director Sándor Erkel, had maintained a limited repertory of historical and folklore opera. By the time that Mahler began his duties, the progressive camp had gained ascendancy following the appointment of the liberal-minded Ferenc von Beniczky as intendant. Aware of the delicate situation, Mahler moved cautiously; he delayed his first appearance on the conductor's stand until January 1889, when he conducted Hungarian-language performances of Das Rheingold and Die Walküre to initial public acclaim. However, his early successes faded when plans to stage the remainder of the Ring cycle and other German operas were frustrated by a renascent conservative faction which favoured a more traditional "Hungarian" programme. In search of non-German operas to extend the repertory, Mahler visited in spring 1890 Italy where among the works he discovered was Pietro Mascagni's recent sensation Cavalleria rusticana (Budapest premiere on 26 December 1890). On 18 February 1889, Bernhard Mahler died; this was followed later in the year by the deaths both of Mahler's sister Leopoldine (27 September) and his mother (11 October). From October 1889 Mahler took charge of his four younger brothers and sisters (Alois, Otto, Justine, and Emma). They were installed in a rented flat in Vienna. Mahler himself suffered poor health, with attacks of haemorrhoids and migraine and a recurrent septic throat. Shortly after these family and health setbacks the premiere of the First Symphony, in Budapest on 20 November 1889, was a disappointment. 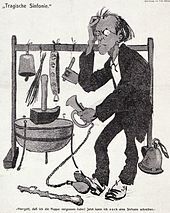 The critic August Beer's lengthy newspaper review indicates that enthusiasm after the early movements degenerated into "audible opposition" after the Finale. Mahler was particularly distressed by the negative comments from his Vienna Conservatory contemporary, Viktor von Herzfeld, who had remarked that Mahler, like many conductors before him, had proved not to be a composer. 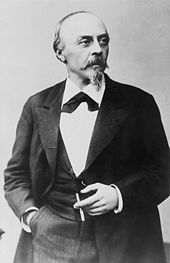 In 1891, Hungary's move to the political right was reflected in the opera house when Beniczky on 1 February was replaced as intendant by Count Géza Zichy, a conservative aristocrat determined to assume artistic control over Mahler's head. However, Mahler had foreseen that and had secretly been negotiating with Bernhard Pollini, the director of the Stadttheater Hamburg since summer and autumn of 1890, and a contract was finally signed in secrecy on 15 January 1891. Mahler more or less "forced" himself to be sacked from his Budapest post, and he succeeded on 14 March 1891. By his departure he received a large sum of indemnity. One of his final Budapest triumphs was a performance of Don Giovanni (16 September 1890) which won him praise from Brahms, who was present at the performances on 16 December 1890. During his Budapest years Mahler's compositional output had been limited to a few songs from the Wunderhorn song settings that became Volumes II and III of Lieder und Gesänge, and amendments to the First Symphony. In the summer of 1892 Mahler took the Hamburg singers to London to participate in an eight-week season of German opera—his only visit to Britain. His conducting of Tristan enthralled the young composer Ralph Vaughan Williams, who "staggered home in a daze and could not sleep for two nights." However, Mahler refused further such invitations as he was anxious to reserve his summers for composing. In 1893 he acquired a retreat at Steinbach, on the banks of Lake Attersee in Upper Austria, and established a pattern that persisted for the rest of his life; summers would henceforth be dedicated to composition, at Steinbach or its successor retreats. Now firmly under the influence of the Wunderhorn folk-poem collection, Mahler produced a stream of song settings at Steinbach, and composed his Second and Third Symphonies there. Performances of Mahler works were still comparatively rare (he had not composed very much). On 27 October 1893, at Hamburg's Konzerthaus Ludwig, Mahler conducted a revised version of his First Symphony; still in its original five-movement form, it was presented as a Tondichtung (tone poem) under the descriptive name "Titan". This concert also introduced six recent Wunderhorn settings. Mahler achieved his first relative success as a composer when the Second Symphony was well-received on its premiere in Berlin, under his own baton, on 13 December 1895. Mahler's conducting assistant Bruno Walter, who was present, said that "one may date [Mahler's] rise to fame as a composer from that day." That same year Mahler's private life had been disrupted by the suicide of his younger brother Otto on 6 February. At the Stadttheater Mahler's repertory consisted of 66 operas of which 36 titles were new to him. During his six years in Hamburg he conducted 744 performances, amongst other he introduced: Verdi's Falstaff, Humperdinck's Hänsel und Gretel, and works by Smetana. However, he was forced to resign his post with the subscription concerts after poor financial returns and an ill-received interpretation of his re-scored Beethoven's Ninth Symphony. Already at an early age Mahler had made it clear that his ultimate goal was an appointment in Vienna, and from 1895 onward was manoeuvring, with the help of influential friends, to secure the directorship of the Vienna Hofoper. He overcame the bar that existed against the appointment of a Jew to this post by what may have been a pragmatic conversion to Roman Catholicism in February 1897. Despite this event, Mahler has been described as a lifelong agnostic. Vienna, the imperial Habsburg capital, had recently elected an anti-Semitic conservative mayor, Karl Lueger, who had once proclaimed: "I myself decide who is a Jew and who isn't." In such a volatile political atmosphere Mahler needed an early demonstration of his German cultural credentials. He made his initial mark in May 1897 with much-praised performances of Wagner's Lohengrin and Mozart's Die Zauberflöte. Shortly after the Zauberflöte triumph, Mahler was forced to take sick leave for several weeks, during which he was nursed by his sister Justine and his long-time companion, the viola player Natalie Bauer-Lechner. Mahler returned to Vienna in late July to prepare for Vienna's first uncut version of the Ring cycle. This performance took place on 24–27 August, attracting critical praise and public enthusiasm. Mahler's friend Hugo Wolf told Bauer-Lechner that "for the first time I have heard the Ring as I have always dreamed of hearing it while reading the score." On 8 October Mahler was formally appointed to succeed Jahn as the Hofoper's director. [n 3] His first production in his new office was Smetana's Czech nationalist opera Dalibor, with a reconstituted finale that left the hero Dalibor alive. This production caused anger among the more extreme Viennese German nationalists, who accused Mahler of "fraternising with the anti-dynastic, inferior Czech nation." The Austrian author Stefan Zweig, in his memoirs The World of Yesterday (1942), described Mahler's appointment as an example of the Viennese public's general distrust of young artists: "Once, when an amazing exception occurred and Gustav Mahler was named director of the Court Opera at thirty-eight years old, a frightened murmur and astonishment ran through Vienna, because someone had entrusted the highest institute of art to 'such a young person' ... This suspicion—that all young people were 'not very reliable'—ran through all circles at that time." Zweig also wrote that "to have seen Gustav Mahler on the street [in Vienna] was an event that one would proudly report to his comrades the next morning as it if were a personal triumph." During Mahler's tenure a total of 33 new operas were introduced to the Hofoper; a further 55 were new or totally revamped productions. However, a proposal to stage Richard Strauss's controversial opera Salome in 1905 was rejected by the Viennese censors. Early in 1902 Mahler met Alfred Roller, an artist and designer associated with the Vienna Secession movement. A year later, Mahler appointed him chief stage designer to the Hofoper, where Roller's debut was a new production of Tristan und Isolde. [n 4] The collaboration between Mahler and Roller created more than 20 celebrated productions of, among other operas, Beethoven's Fidelio, Gluck's Iphigénie en Aulide and Mozart's Le nozze di Figaro. In the Figaro production, Mahler offended some purists by adding and composing a short recitative scene to Act III. Plaque on Mahler's Vienna apartment, 2 Auenbruggerstrasse: "Gustav Mahler lived and composed in this house from 1898 to 1909". In spite of numerous theatrical triumphs, Mahler's Vienna years were rarely smooth; his battles with singers and the house administration continued on and off for the whole of his tenure. While Mahler's methods improved standards, his histrionic and dictatorial conducting style was resented by orchestra members and singers alike. 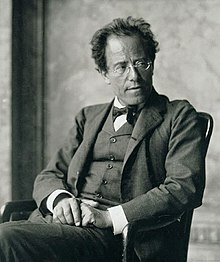 In December 1903 Mahler faced a revolt by stagehands, whose demands for better conditions he rejected in the belief that extremists were manipulating his staff. The anti-Semitic elements in Viennese society, long opposed to Mahler's appointment, continued to attack him relentlessly, and in 1907 instituted a press campaign designed to drive him out. By that time he was at odds with the opera house's administration over the amount of time he was spending on his own music, and was preparing to leave. 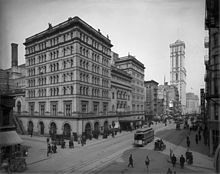 In May 1907 he began discussions with Heinrich Conried, director of the New York Metropolitan Opera, and on 21 June signed a contract, on very favourable terms, for four seasons' conducting in New York. At the end of the summer he submitted his resignation to the Hofoper, and on 15 October 1907 conducted Fidelio, his 645th and final performance there. During his ten years in Vienna, Mahler had brought new life to the opera house and cleared its debts, but had won few friends—it was said that he treated his musicians in the way a lion tamer treated his animals. His departing message to the company, which he pinned to a notice board, was later torn down and scattered over the floor. After conducting the Hofoper orchestra in a farewell concert performance of his Second Symphony on 24 November, Mahler left Vienna for New York in early December. When Richter resigned as head of the Vienna Philharmonic subscription concerts in September 1898,[n 5] the concerts committee had unanimously chosen Mahler as his successor. The appointment was not universally welcomed; the anti-Semitic press wondered if, as a non-German, Mahler would be capable of defending German music. Attendances rose sharply in Mahler's first season, but members of the orchestra were particularly resentful of his habit of re-scoring acknowledged masterpieces, and of his scheduling of extra rehearsals for works with which they were thoroughly familiar. An attempt by the orchestra to have Richter reinstated for the 1899 season failed, because Richter was not interested. Mahler's position was weakened when, in 1900, he took the orchestra to Paris to play at the Exposition Universelle. The Paris concerts were poorly attended and lost money—Mahler had to borrow the orchestra's fare home from the Rothschilds. In April 1901, dogged by a recurrence of ill-health and wearied by more complaints from the orchestra, Mahler relinquished the Philharmonic concerts conductorship. In his three seasons he had performed around 80 different works, which included pieces by relatively unknown composers such as Hermann Goetz, Wilhelm Kienzl and the Italian Lorenzo Perosi. The demands of his twin appointments in Vienna initially absorbed all Mahler's time and energy, but by 1899 he had resumed composing. The remaining Vienna years were to prove particularly fruitful. While working on some of the last of his Des Knaben Wunderhorn settings he started his Fourth Symphony, which he completed in 1900. By this time he had abandoned the composing hut at Steinbach and had acquired another, at Maiernigg on the shores of the Wörthersee in Carinthia, where he later built a villa. In this new venue Mahler embarked upon what is generally considered as his "middle" or post-Wunderhorn compositional period. Between 1901 and 1904 he wrote ten settings of poems by Friedrich Rückert, five of which were collected as Rückert-Lieder. [n 6] The other five formed the song cycle Kindertotenlieder ("Songs on the Death of Children"). The trilogy of orchestral symphonies, the Fifth, the Sixth and the Seventh were composed at Maiernigg between 1901 and 1905, and the Eighth Symphony written there in 1906, in eight weeks of furious activity. Mahler made his New York debut at the Metropolitan Opera on 1 January 1908, when he conducted Wagner's Tristan und Isolde. In a busy first season Mahler's performances were widely praised, especially his Fidelio on 20 March 1908, in which he insisted on using replicas that were at the time being made of Alfred Roller's Vienna sets. On his return to Austria for the summer of 1908, Mahler established himself in the third and last of his composing studios, in the pine forests close to Toblach in Tyrol. Here, using a text by Hans Bethge based on ancient Chinese poems, he composed Das Lied von der Erde ("The Song of the Earth"). Despite the symphonic nature of the work, Mahler refused to number it, hoping thereby to escape the "curse of the Ninth Symphony" that he believed had affected fellow-composers Beethoven, Schubert and Bruckner. On 19 September 1908 the premiere of the Seventh Symphony, in Prague, was deemed by Alma Mahler a critical rather than a popular success. Back in Europe for the summer of 1909, Mahler worked on his Ninth Symphony and made a conducting tour of the Netherlands. The 1909–10 New York Philharmonic season was long and taxing; Mahler rehearsed and conducted 46 concerts, but his programmes were often too demanding for popular tastes. His own First Symphony, given its American debut on 16 December 1909, was one of the pieces that failed with critics and public, and the season ended with heavy financial losses. The highlight of Mahler's 1910 summer was the first performance of the Eighth Symphony at Munich on 12 September, the last of his works to be premiered in his lifetime. The occasion was a triumph—"easily Mahler's biggest lifetime success," according to biographer Robert Carr—but it was overshadowed by the composer's discovery, before the event, that Alma had begun an affair with the young architect Walter Gropius. Greatly distressed, Mahler sought advice from Sigmund Freud, and appeared to gain some comfort from his meeting with the psychoanalyst. One of Freud's observations was that much damage had been done by Mahler's insisting that Alma give up her composing. Mahler accepted this, and started to positively encourage her to write music, even editing, orchestrating and promoting some of her works. Alma agreed to remain with Mahler, although the relationship with Gropius continued surreptitiously. In a gesture of love, Mahler dedicated his Eighth Symphony to her. In spite of the emotional distractions, during the summer of 1910 Mahler worked on his Tenth Symphony, completing the Adagio and drafting four more movements. He and Alma returned to New York in late October 1910, where Mahler threw himself into a busy Philharmonic season of concerts and tours. Around Christmas 1910 he began suffering from a sore throat, which persisted. On 21 February 1911, with a temperature of 40 °C (104 °F), Mahler insisted on fulfilling an engagement at Carnegie Hall, with a program of mainly new Italian music, including the world premiere of Busoni's Berceuse élégiaque. This was Mahler's last concert. After weeks confined to bed he was diagnosed with bacterial endocarditis, a disease to which sufferers from defective heart valves were particularly prone and could be fatal. Mahler did not give up hope; he talked of resuming the concert season, and took a keen interest when one of Alma's compositions was sung at a public recital by the soprano Frances Alda, on 3 March. On 8 April the Mahler family and a permanent nurse left New York on board SS Amerika bound for Europe. They reached Paris ten days later, where Mahler entered a clinic at Neuilly, but there was no improvement; on 11 May he was taken by train to the Löw sanatorium in Vienna, where he developed pneumonia and entered a coma. Hundreds had come to the sanitorium during this brief period to show their admiration for the great composer. After receiving treatments of radium to reduce swelling on his legs and morphine for his general ailments, he died on 18 May. Alma Mahler survived her husband by more than 50 years, dying in 1964. She married Walter Gropius in 1915, divorced him five years later, and married the writer Franz Werfel in 1929. In 1940 she published a memoir of her years with Mahler, entitled Gustav Mahler: Memories and Letters. This account was criticised by later biographers as incomplete, selective and self-serving, and for providing a distorted picture of Mahler's life. [n 8] The composer's daughter Anna Mahler became a well-known sculptor; she died in 1988. The International Gustav Mahler Society was founded in 1955 in Vienna, with Bruno Walter as its first president and Alma Mahler as an honorary member. The Society aims to create a complete critical edition of Mahler's works, and to commemorate all aspects of the composer's life. For a complete listing of Mahler's works, see List of compositions by Gustav Mahler. The middle period comprises a triptych of purely instrumental symphonies (the Fifth, Sixth and Seventh), the "Rückert" songs and the Kindertotenlieder, two final Wunderhorn settings and, in some reckonings, Mahler's last great affirmative statement, the choral Eighth Symphony. Cooke believes that the Eighth stands on its own, between the middle and final periods. Mahler had by now abandoned all explicit programmes and descriptive titles; he wanted to write "absolute" music that spoke for itself. Cooke refers to "a new granite-like hardness of orchestration" in the middle-period symphonies, while the songs have lost most of their folk character, and cease to fertilise the symphonies as explicitly as before. The three works of the brief final period—Das Lied von der Erde, the Ninth and (incomplete) Tenth Symphonies—are expressions of personal experience, as Mahler faced death. Each of the pieces ends quietly, signifying that aspiration has now given way to resignation. Cooke considers these works to be a loving (rather than a bitter) farewell to life; the composer Alban Berg called the Ninth "the most marvellous thing that Mahler ever wrote." None of these final works were performed in Mahler's lifetime. Except for his juvenilia, little of which has survived, Mahler composed only in the media of song and symphony, with a close and complex interrelationship between the two. [n 9] Donald Mitchell writes that this interaction is the backcloth against which all Mahler's music can be considered. The initial connection between song and symphony occurs with the song-cycle Lieder eines fahrenden Gesellen and the First Symphony. Although this early evidence of cross-fertilisation is important, it is during Mahler's extended Wunderhorn phase, in which his Second, Third and Fourth Symphonies were written, that the song and symphony genres are consistently intermingled. Themes from the Wunderhorn song Das himmlische Leben ("The Heavenly Life"), composed in 1892, became a key element in the Third Symphony completed in 1896; the song itself forms the finale to the Fourth (1900) and its melody is central to the whole composition. For the Second Symphony, written between 1888 and 1894, Mahler worked simultaneously on the Wunderhorn song, Des Antonius von Padua Fischpredigt ("The Sermon of St Anthony of Padua to the Fishes"), and on the Scherzo based on it which became the symphony's third movement. 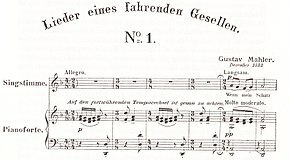 Another Wunderhorn setting from 1892, Urlicht ("Primal Light"), is used as the Second Symphony's fourth (penultimate) movement. A mix of enthusiasm, consternation and critical contempt became the normal response to new Mahler symphonies, although the songs were better received. After his Fourth and Fifth Symphonies failed to gain general public approval, Mahler was convinced that his Sixth would finally succeed. However, its reception was dominated by satirical comments on Mahler's unconventional percussion effects—the use of a wooden mallet, birch rods and a huge square bass drum. Viennese critic Heinrich Reinhardt dismissed the symphony as "Brass, lots of brass, incredibly much brass! Even more brass, nothing but brass!" The one unalloyed performance triumph within Mahler's lifetime was the premiere of the Eighth Symphony in Munich, on 12 September 1910, advertised by its promoters as the "Symphony of a Thousand. "[n 10] At its conclusion, applause and celebrations reportedly lasted for half an hour. Performances of Mahler's works became less frequent after his death. In the Netherlands the advocacy of Willem Mengelberg ensured that Mahler remained popular there, and Mengelberg's engagement with the New York Philharmonic from 1922 to 1928 brought Mahler regularly to American audiences. However, much American critical reaction in the 1920s was negative, despite a spirited effort by the young composer Aaron Copland to present Mahler as a progressive, 30 years ahead of his time and infinitely more inventive than Richard Strauss. Earlier, in 1916, Leopold Stokowski had given the American premieres of the Eighth Symphony and Das Lied von der Erde in Philadelphia. The Eighth was a sensationally successful performance that was immediately taken to New York where it scored a further triumph. An early proponent of Mahler's work in Britain was Adrian Boult, who as conductor of the City of Birmingham Orchestra performed the Fourth Symphony in 1926 and Das Lied von der Erde in 1930. The Hallé Orchestra brought Das Lied and the Ninth Symphony to Manchester in 1931; Sir Henry Wood staged the Eighth in London in 1930, and again in 1938 when the young Benjamin Britten found the performance "execrable" but was nevertheless impressed by the music. British critics during this period largely treated Mahler with condescension and faint praise. Thus Dyneley Hussey, writing in 1934, thought the "children's songs" were delightful, but that the symphonies should be let go. Composer-conductor Julius Harrison described Mahler's symphonies as "interesting at times, but laboriously put together" and as lacking creative spark. Bernard Shaw, in his role as music critic, thought that the musical audiences of the 1930s would find Mahler (and Bruckner) "expensively second-rate." In Hamburg, the Gustav Mahler Museum is dedicated to Gustav Mahler's life and work. 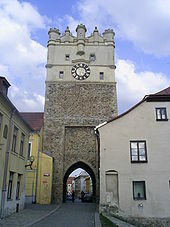 It is situated in the Composers Quarter. In Altschluderbach, near Toblach in South Tyrol, Italy, there remains a little museum and memorial in the former composers hut of Mahler. It is situated in the animal park next to the Gustav Mahler Stube. The Stube formerly had a museum on the first floor. 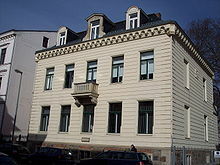 There, Mahler and his wife Alma resided from 1907 to 1910. 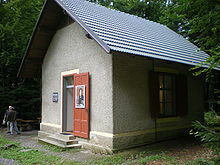 There are more former composers huts of Mahler that still exist; both are equipped as little museums. 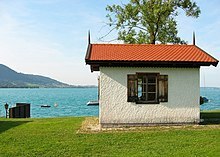 There is one composing hut at the Attersee, Upper Austria, and one at the Wörthersee in Carinthia. ^ The music of Der Trompeter von Säkkingen has been mostly lost. A movement entitled "Blumine" was included in the first, five-movement version of Mahler's First Symphony. 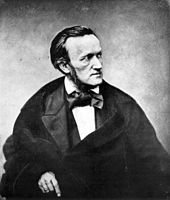 ^ Mahler may have been aware of this collection earlier, since he had based the first of the Lieder eines fahrenden Gesellen poems on a Wunderhorn text. ^ Some sources, e.g., Paul Banks writing in Sadie, p. 509, give the appointment date as 8 September 1897. According to La Grange the decree appointing Mahler to the directorship was dated 8 October and signed by the Lord Chamberlain on behalf of the Emperor on 15 October. ^ Alma Schindler, Mahler's future wife, claimed to have introduced Mahler to Roller at her stepfather's house in January 1902. However, there is some evidence that Roller had worked on designs for the Hofoper as early as January 1901. ^ The subscription concerts were an annual programme of orchestral concerts, performed by the Vienna Philharmonic Orchestra which comprised the elite instrumentalists from the Hofoper. Mahler was therefore well known to the players before he began his duties as the concerts conductor. ^ One of the Rückert poems, "Liebst du um Schönheit", was left unorchestrated until this was carried out by a Leipzig musician, Max Puttmann. The song is usually performed alongside the others. ^ See, for example, the letters to Alma sent from Munich in 1910, the last of which begins: "My beloved, madly beloved Almschili! Believe me, I am sick with love!" Biographer Robert Carr, however, notes the extent to which Alma Mahler edited and selected the letters which she published in her book Memories and Letters, initially published in 1940. ^ The term "Alma Problem" has been used to refer to the difficulties that Alma's distortions have created for subsequent historians. Jonathan Carr writes: "[B]it by bit, more about Alma has emerged to cast still graver doubt on her published work ... Letters from Mahler to her have come to light in a more complete form than she chose to reveal. It is now plain that Alma did not just make chance mistakes and see things 'through her own eyes.' She doctored the record." ^ Mitchell differentiates between "song" and "song-cycle"; he also disparages the term "song-symphonist," which he calls "a horrid cliché that belongs to the dubious history of Mahler's critics." ^ The title "Symphony of a Thousand" was not acknowledged by Mahler. Robert Carr indicates that, at its Munich premiere, there were fewer than 1000 performers present. At the American premiere under Leopold Stokowski in 1916, however, there were 1,068 performers, including 950 choristers. ^ "Mahler's Mother: Marie Herrmann Mahler". Classic FM. Archived from the original on 26 January 2018. ^ a b c d e Franklin, (1. Background, childhood education 1860–80). ^ a b Franklin, (2. 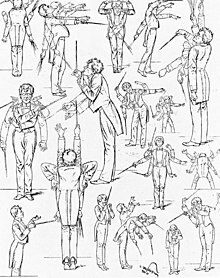 Early conducting career, 1880–83). ^ Franklin, (3. Kassel, 1883–85). ^ a b c d e f Franklin, (4. Prague 1885–86 and Leipzig 1886–88). ^ Franklin, (10. Das klagende Lied, early songs, First symphony). ^ a b c d e Franklin, (5. Budapest 1888–91). ^ a b c d e Franklin, (6. Hamburg 1891–97). ^ Smith 2002, pp. 76–77. ^ Stefan Zweig, Die Welt von Gestern. Erinnerungen eines Europäers, quoted in Fischer 2011, p. 58. ^ La Grange, Vol. 2 pp. 632–34. ^ Bert van der Waal van Dijk. "Chronology – Year 1910". gustav-mahler.eu. ^ "The Philharmonic Concert – An Interesting Programme of Music Representing Italy". The Sun. New York. 22 February 1911. p. 7. Retrieved 16 September 2013. ^ Fischer, Jens Malte; Translated by Stewart Spencer (April 2013). Gustav Mahler. Yale University Press. p. 683. ISBN 9780300194111. ^ Fischer, Jens Malte; Translated by Stewart Spencer (April 2013). Gustav Mahler. Yale University Press. p. 684. ISBN 9780300194111. ^ Mahler, Alma. Gustav Mahler: Memories and Letters. p. 197. ^ "International Gustav Mahler Society, Vienna (Historical Notes: click on "The Society" and "History")". The International Gustav Mahler Society. Retrieved 4 April 2010. ^ Kennedy, Michael (13 January 2010). "Mahler's Mass Following". The Spectator. London. Retrieved 6 May 2016. ^ Niekerk pp. 216, 271. ^ Fischer, Jens Malte (April 2013). Gustav Mahler (1st English ed.). Yale UP. p. 692. Anon. (1908). "Gustav Mahler Conducts" (PDF). The New York Times (30 November 1908). Retrieved 21 March 2010. Anon. (1909). "Bartered Bride at Metropolitan" (PDF). The New York Times (20&nbsp, February). 20 February 1909. Retrieved 20 June 2009. Anon. (1911). "Gustav Mahler Dies in Vienna" (PDF). The New York Times (19&nbsp, May). Retrieved 21 March 2010. Brown, Mark (5 August 2016). "Beethoven's Eroica voted greatest symphony of all time". The Guardian. Retrieved 29 March 2018. Carr, Jonathan (1998). Mahler: A Biography. Woodstock, NY: The Overlook Press. ISBN 0-87951-802-2. Cooke, Deryck (1980). Gustav Mahler: An Introduction to His Music. London, England: Faber Music. ISBN 0-571-10087-2. Copland, Aaron (2004). Richard Kostelanetz (ed.). Aaron Copland, a reader: Selected writings, 1923–72. London, England: Routledge. ISBN 978-0-415-93940-9. Fischer, Jens Malte (trans. Stewart Spencer) (2011). Gustav Mahler. New Haven, Connecticut: Yale University Press. ISBN 978-0-300-13444-5. Harrison, Julius (1934). "The Orchestra and Orchestral Music". In Bacharach, A.L. (ed.). The Musical Companion. London, England: Victor Gollancz. pp. 127–282. Hussey, Dyneley (1934). "Vocal Music in the 20th Century". In Bacharach, A.L. (ed.). The Musical Companion. London, England: Victor Gollancz. pp. 454–66. "International Gustav Mahler Society, Vienna". The International Gustav Mahler Society. Retrieved 4 April 2010. Kennedy, Michael (13 January 2010). "Mahler's Mass Following". The Spectator. London, Enhland. Retrieved 26 March 2010. Kozinn, Allan (3 February 1989). "Ashkenazy Mining a Mahler Vein". The New York Times. Retrieved 6 April 2010. La Grange, Henry-Louis de (2000). Gustav Mahler Volume 3: Vienna: Triumph and Disillusion (1904–1907). Oxford, England: Oxford University Press. ISBN 0-19-315160-X. Lebrecht, Norman (2011). Why Mahler? How One Man and Ten Symphonies Changed the World. London, England: Faber and Faber Ltdb. ISBN 978-0-571-26079-9. Mahler, Almav (1968). Gustav Mahler: Memories and Letters. London, England: John Murrayv. Mitchell, Donald (1995). Gustav Mahler Volume 1: The Early Years. Berkeley, CA: University of California Press. ISBN 0-520-20214-7. Mitchell, Donald (1975). Gustav Mahler Volume II: The Wunderhorn Years: Chronicles and Commentaries. London, England: Faber and Faber. ISBN 0-571-10674-9. Mitchell, Donald; Nicholson, Andrew (1999). The Mahler Companion. Oxford, England: Oxford University Press. ISBN 0-19-816376-2. Niekerk, Carl (2010). Reading Mahler: German Culture and Jewish Identity in Fin-de-siècle Vienna. Rochester, NY: Camden House. ISBN 978-1-57113-467-7. Sadie, Stanley, ed. (1980). The New Grove Dictionary of Music and Musicians. 11. London, England: Macmillan. ISBN 0-333-23111-2. Schiff, David (4 November 2001). "Music: The Man Who Mainstreamed Mahler". The New York Times. Retrieved 27 March 2010. Schonberg, Harold (1970). The Lives of the Great Composers. II. London, England: Futura Publications. ISBN 0-86007-723-3. Shaw, George Bernard (1981). Shaw's Music, Volume III 1893–1950. London, England: The Bodley Head. ISBN 0-370-30333-4. Smith, Warren Allen (2002). Celebrities in Hell. Fort Lee, New Jersey: Barricade Books. ISBN 978-0-55783752-6. Snowman, Daniel (2009). The Gilded Stage: A Social History of Opera. London, England: Atlantic Books. ISBN 978-1-84354-466-1. Steen, Michael (2003). The Lives and Times of the Great Composers. London, England: Icon Books. ISBN 978-1-84046-679-9. This page was last edited on 15 April 2019, at 13:14 (UTC).